On 7 May, ISIS’s official media arm claimed responsibility for an ambush of fighters belonging to the Government of National Accord (GNA) affiliated Misratan Third Force 100km south-west of Sirte. The Misratans were attacked in the al-Loud agricultural district as they were being transported by bus from Jufra to Misrata. Two Misratans were killed and one was injured in the assault. 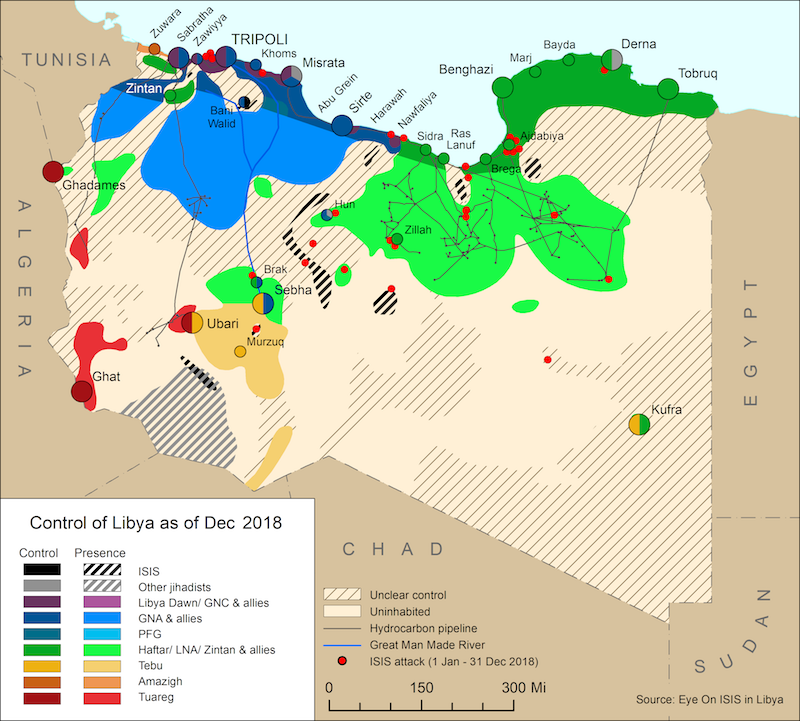 This is the first official operation claimed by ISIS since its defeat at the hands of the Misratan-led al-Bunyan al-Marsus coalition in Sirte in December. Many Misratans are angry at what they see as an ‘ill-fated alliance’ between moderate Misratans and the Benghazi Defence Brigades (BDB). The BDB have withdrawn from Jufra to camp elsewhere in the desert south of Sirte. 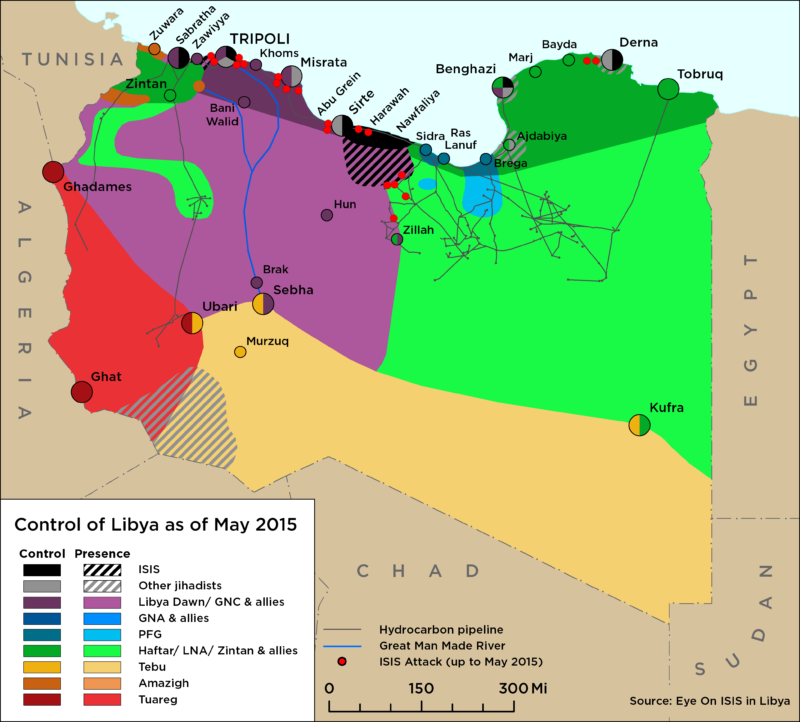 One of the BDB’s commanders, al-Saadi al-Nawfali, is known to have been a former leader of Ansar al-Sharia in Ajdabiya and is believed to be closely connected with Libyans who joined ISIS. Last week, a new video was published showing the execution of an Algerian ISIS fighter by Captain Mahmood al-Werfalli, a notorious field commander of the Libyan National Army’s (LNA) Saiqa Special Forces. The ISIS fighter is believed to be Milood Abu Azzaz who was captured on 6 May by LNA fighters in the Sabri area of Benghazi, as he was preparing an IED. Azzaz was handed over to Werfalli, who executed him on film ‘under Sharia proceedings’ the same day.